Borders is a one-stop shop for everyone, with books that are powerful and allow individuals to be literally inspired. Borders has brought in authors such as John Gray (Men are from Mars and Women are from Venus), Jack Cannfield (Chicken Soup series), Dougg Lipp (Disney U). it has had CEO’s ranging from Mr. Khalaf Al Habtoor to Polticians such as Dr. Shashi Tharoor and also individuals from the Indian army such as General J.J. Singh whose book was launched by the Indian Ambassador in Dubai. Borders has also received acknowledgements and certificate of appreciation from the Dubai Government for participation in their various events. Borders is a proud supporter of Charity Campaigns such as Breast Cancer Arabia and also doing Book Fairs with Gems Schools in Dubai. Books are there to spend hours poring over in a library or bookstore. Books are there to smell, touch, thumb through, scribble notes in, bend pages, crease spines, share with friends and then finally place on a bookshelf amongst their peers. You can’t feel a downloaded book. You can’t smell it. And you definitely can’t put in on your bookshelf as part of your decor. 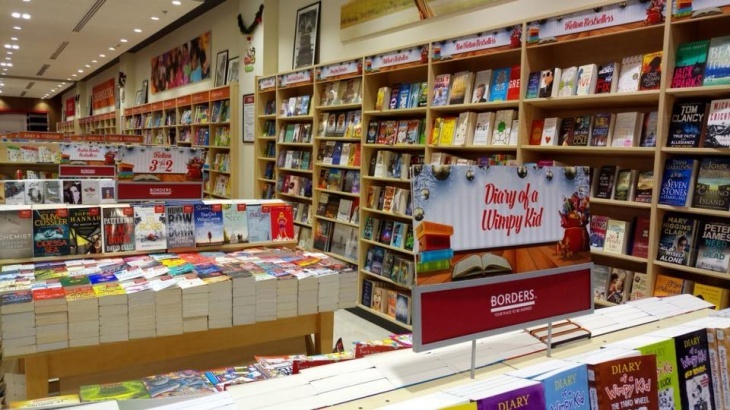 Borders provides not only books but also a wide variety of toys and stationery. It is now being considered as the pioneers for the stationery section in its various stores.